The DSB 6000 is an O2 plasma Asher primarily made to strip, descum photoresist and remove polymers deposited during other Plasma etching processes. With the DSB600 Asher samples or wafers up to 8 inch can be directly placed on a heated chuck or in a quartz cassette of 25 wafers. Both the chuck and chamber temperatures can be set up to 250 and 180 °C respectively. O2, N2 and CF4 mass flow controllers are available with the machine at 300, 50 and 40sccm respectively. An ICP power of up to 600W. The tool is controlled and operated with a PLC controller and a touchscreen computer. The temperature of the chuck can go up to 250°C, which makes the processed wafers hot, holding processed wafers with clean room gloves can harm the user. It’s recommended to use your tweezers to move samples from the tool to outside. For some processes pre-setting the chuck temperature to high values causes baking and fuming the photoresist on samples. It’s highly advisable not to breathe the fumes coming out of the heated photo resists. The Information Panel displays a view or views of the graphical information and graphics for each functional area. Graphics and other display objects are shown on this panel to achieve the control and monitoring capability required. The Command Panel is a column of command buttons on the right-hand side. The Command Panel only relates to the Information Panel currently being shown. The Navigation Panel is used to switch between functional areas. In order to use the software and access to any screens, the user must be connected. Logon button is located in the title panel. 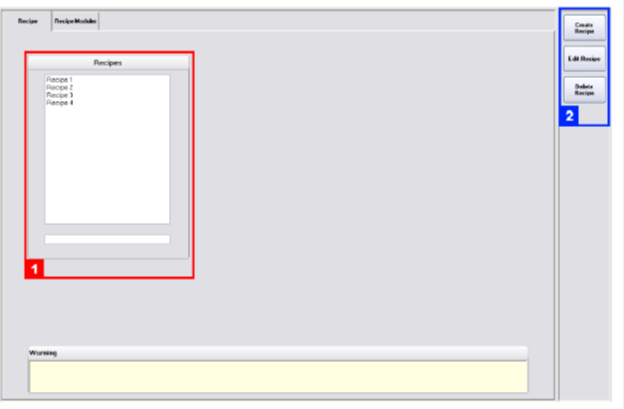 Once the user is connected, logon button’s text becomes the user name. 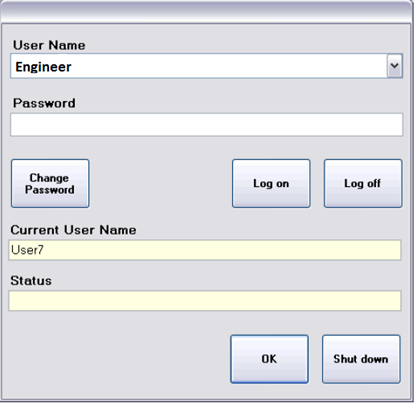 The user needs to select the username Engineer, enter the password recipe and click on Log on button. To be logged off, click on Log off button. Status field displays some information about current operation and its result. OK button allows closing the Logon dialog box. Shut Down allows user to close the software. As an engineer user you will have access only to the Main and the Recipe menus. It contains a representation of the DSB 6000 and indicates all process values. It also allows operator to start a process by clicking on Create Job button (-2-). 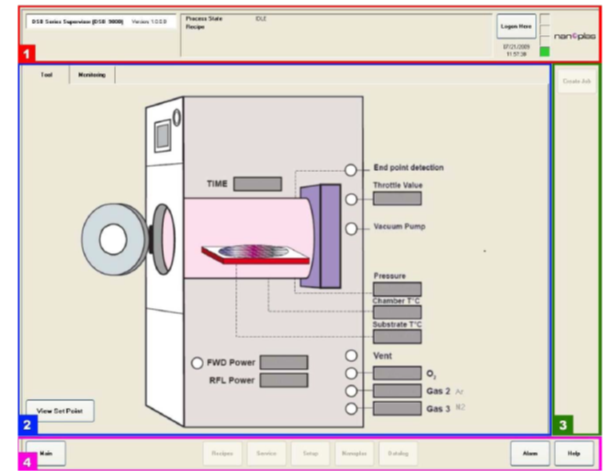 View Set Point button (-1-) can be used to display all set point values. When operator clicks on Create Job button, the Recipe Selection dialog box appears. Once the Start button of Recipe Selection dialog box has been clicked, the PLC will start the recipe. 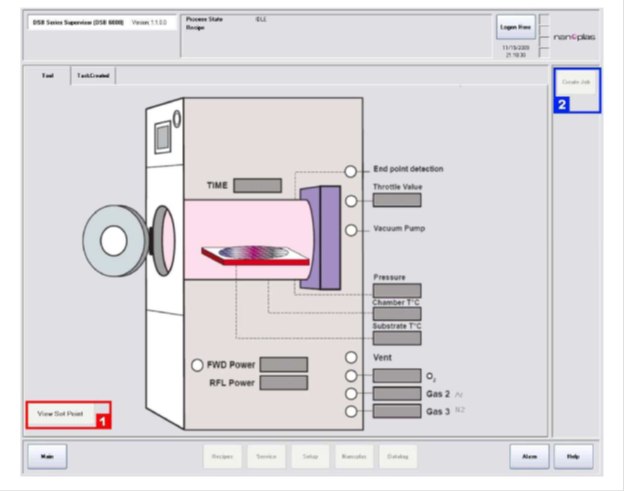 At the end of process the software waits for operator to acknowledge this end, Command Panel is updated and Completed button is shown and venting the chamber starts automatically. If the tool is in IDLE since a long time the equipment goes automatically in StandBy mode. In this mode, operator has to activate the equipment first before starting a new recipe using the Vent button. Recipe tab lists all existing Recipes inside Recipe area (-1-). Command Panel (-2-) allow to Create, Edit or Delete a Recipe. To create a new Recipe Create Recipe button must be clicked. Then Creating Recipe dialog box is show. To edit an existing Recipe, select one in Recipe tab and click on Edit Recipe button. Then Editing Recipe dialog box is shown.